White, Small - SHIPS FREE! White, Medium - SHIPS FREE! White, Large - SHIPS FREE! White, X-Large - SHIPS FREE! Khaki, Small - SHIPS FREE! Khaki, Medium - SHIPS FREE! Khaki, Large - SHIPS FREE! Khaki, X-Large - SHIPS FREE! The Comfort Collection by Dr. Comfort means compression benefits with an ultra-soft feel allowing for longer wearing time. Shape To Fit™ Men's Cotton Dress Socks have moderate 15-20 mmHg compression to help tired, fatigued and achy legs and feet from poor circulation. Blood pooling from inadequate veins make it difficult for blood to return to the heart. Compression wear assists with blood flow by offering graduated compression with tighter compression at the ankles. It's also beneficial for men who have diabetes, deep vein and other medical conditions. Shape To Fit Men's Cotton Dress Knee Highs are available in colors white, khaki and black for business or casual attire. Shape To Fit compression wear is designed with Dr. Comfort's signature non-binding support band and its proprietary soft-seam construction. These features play a role in being delicate to fragile skin. 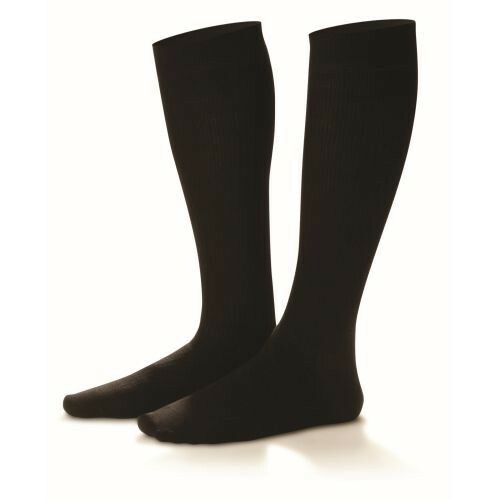 This comfort allows user to wear the dress socks longer to get maximum benefits from compression wear. In addition, the all-natural cotton fabric is breathable with a touch of Lycra to stretch and conform to foot. Dr. Comfort's has the stylish Rejuva line of unisex socks such as the Rejuva Argyle Compression Socks in 15-20 mmHg moderate compression that also work well with business or casual attire.